That gravy is so sinful! Hello again, so this is my second time that I am writing this post up, because my program crashed and like an idiot I did not use a different platform to save this on. I'm exhausted and now that it is 30 minutes past when I thought I would be done writing my blog, I am even more exhausted. Braedon is learning a lot right now. He is all over the place. His favorite things to do are scare the living daylight out of mom and dad. He loves wires. I mean LOVES wires. We need to get out of this tiny apartment so that we can baby proof and have a somewhat organized life again. My living room currently looks like a play land. I almost totally forgot! My little man turned 7 months yesterday! We are on the downward spiral to a year and I am scared to death! Can you see his awesome little tooth? My moods have been up and down lately. I hate having anxiety and depression to the point of not wanting to get up in the morning. I am glad I have such a great support team around me that help me to conquer the little things in life. I went out with a really good friend of mine today. We did everything from makeup to macrons. I felt like I was in high school again doing make up in the woman's bathroom. She's not much of a makeup wearer, so it was cool to see her face transform. She took some great shots of me afterwards. If you are in the Bay Area and need a portrait photographer, Chloe Fan is the way to go. Just click for her link! I got a bunch of macrons from Cako once we got inside to sit down for a while. And then like the photography nerd that I am, I proceeded to take so many pictures of them. 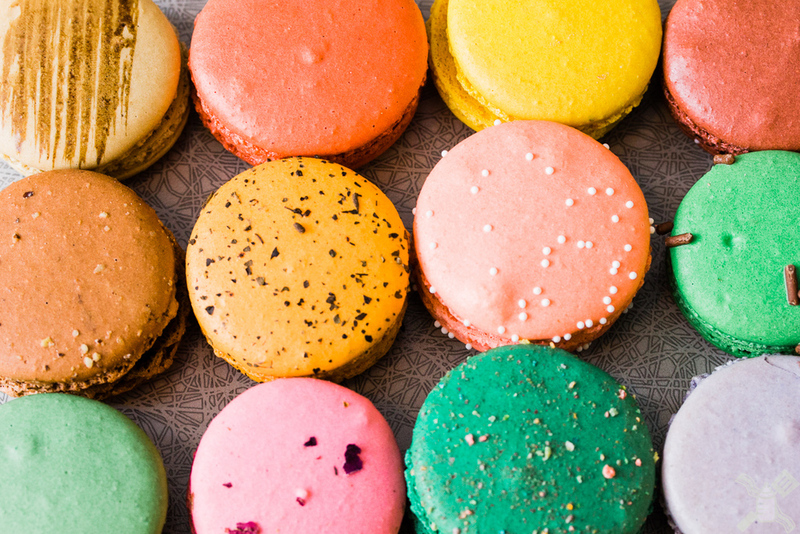 They were so gorgeous, I love how colorful macrons are. I am going to teach myself to make them so that I can have more beautiful pictures! hah! We must have looked so strange styling and photographing sweets in the middle of a food court. I mean, probably not, San Francisco has much stranger people than us! Gareth got to spend the day with Braedon. He said that they had fun. I got lots of great little pictures of my men. I missed Braedon so much, but it is nice to get out every now and then. I am still trying to get this blog up and running successfully. Comment and tell me what you want to see on Wednesdays, I am open to any and all suggestions! I might do another challenge so that I can get more content up and more hits on the site! :P I just like feeling like I am doing something other than just being mom. I really want my food photography business to flourish, but it will take a lot of work. I'm also hoping to do a few catering gigs throughout the next year. I love being in the kitchen so much, I miss it sometimes. Without further adieu or rambling, I am giving you my smothered pork chop recipe! This is a great weekday meal because it doesn't take that much time to make at all. You can pair it with a starch (potato) or with some nice green vegetables for a fresher taste. There you go. An easy weekday meal for you to try! As always, follow my instagram, twitter, comment here, subscribe here, tell me what you think, what your deepest wants and desires are! :P I will see you on Wednesday!